GAVI or Global Alliance for Vaccines and Immunization is a public-private global health partnership committed to increasing access to immunisation in poor countries. Gavi was launched in 2000, at a time when the distribution of vaccines to children in the poorest parts of the world had begun to falter. By the end of the 1990s, immunisation rates were stagnating or even declining. Nearly 30 million children born every year in developing countries were not fully immunised. With a US $750 million commitment from the Bill & Melinda Gates Foundation, the vision of delivering vaccines to these children suddenly came within reach. Since its launch in 2000, Gavi has, contributed to the immunization of an additional 370 million children, helping developing countries prevent more than 5.5 million future deaths from hepatitis B, Haemophilus influenza type B (Hib), measles, pertussis, pneumococcal disease, polio, rotavirus diarrhoea and yellow fever. Between now and 2015, GAVI can accelerate access to new vaccines that will save a further four million lives. This would have a significant impact on achieving the 4th Millennium Development Goal to reduce by two thirds, between 1990 and 2015, the under-five mortality rate by 2015. Gavi has been promoting the use of pentavalent vaccines all over the world to ensure developing nations have access to global immunization programs. In July 2013, Gavi issued a $700 million bond to purchase vaccines to fight pneumonia and diarrhea, which are two of the most frequent killers of children under the age of five. Gavi will also purchase vaccines for diphtheria, tetanus, pertussis, HIB and hepatitis B. The bond issue will fund immunization efforts supported by Gavi. The transaction was done by the International Finance Facility for Immunisation. Jim Yong Kim, president of the World Bank Group, which is IFFIm’s treasury manager, said that having predictable, long-term funding in place will help them ensure that the world’s most vulnerable children have access to healthcare, and that is a critical step in achieving the goal of ending extreme poverty by 2030. Countries that are eligible for Gavi support actively take the lead. They determine what their immunisation needs are, apply for funding and oversee the implementation of their vaccination programmes. Gavi's co-financing policy requires that recipient countries contribute towards the cost of the vaccines. This further strengthens ownership and long-term sustainability of immunisation programmes. The fact that countries increasingly demand Gavi-funded vaccines and are prepared to co-finance them shows their strong commitment to improving the health of their populations. The following table lists the GAVI Alliance's committed funding as recorded in their International Aid Transparency Initiative (IATI) publications. DAC 5-Digit Sector names are used. ↑ Boseley, Sarah (2011-11-17). "Green light from Gavi for cervical cancer vaccine". Guardian. Retrieved 2014-04-29. ↑ 25 January 2013 (2013-01-25). "AllAfrica". AllAfrica. Retrieved 2014-04-29. ↑ "Supplies and Logistics - GAVI". UNICEF. 2007-04-09. Retrieved 2013-01-27. ↑ "Foundation Fact Sheet – Bill & Melinda Gates Foundation". Gatesfoundation.org. Retrieved 2013-01-27. ↑ Parrish, Ryan (July 3, 2013). 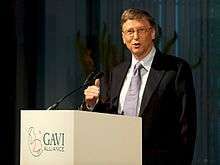 "GAVI announces $700 million bond issue to fund child immunization". Vaccine News. Retrieved 8 July 2013. ↑ "GAVI Alliance". IATI Registry. Retrieved September 6, 2016. ↑ "DAC 5 Digit Sector". The IATI Standard. Retrieved September 6, 2016.